Pencil mine soft, superior, to sketch and design professional. The graduations quite accurate (from 8B to 2H) produce different effects, shadows and contrasts with well defined. 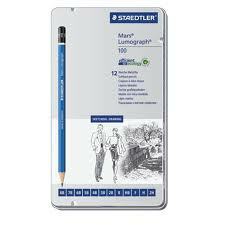 The Pencil Mars Lumograph have high resistance to breakage and is easy to sharpen and erase. The Pencil Mars Lumograph there in 16 degrees, especially since the soft (8B) to be very hard (6H), available in tins of 6 or 12 assorted units.